So, you’ve heard about weighted blankets and you’re wondering what all the hype is about, and whether you would like to use one or not. It’s a great idea to experiment a little first, in order to know if it's the right fit for you, so that you can stay away from becoming a new member of the second group. Primarily you must figure out whether you will be comfortable sleeping under a bit of extra weight. This might take a few nights trying out various ways to add weight while you sleep. So, let’s have a look at what you can do at home to make this experiment a success. What Can I Use as a Cheap Weighted Blanket Trial? 1 What Can I Use as a Cheap Weighted Blanket Trial? 2.1 Will the blanket company help you? 3 How to Get a Weighted Blanket Covered by Medical Insurance? 4 Is all this trouble going to be worthy? All of your trials will require the use of 2 or more weighted blankets and a duvet cover. You’ll also need large safety pins, a large needle and strong thread, and a maybe a stack of small plastic Ziploc bags. You can use a fabric of your choice, but I suggest choosing comforters that are a bit heavier and of a more sturdy material as you will be stuffing them with all kinds of things for your weighted comforter trials. If you'd like to get to real deal, you can skip the trials, and just read about making your own weighted quilt here. Here is a list of ways you can test whether you would like a lot of weight on top of you while you sleep or not. I’ve seen many people do this in different ways from folding thick cotton blankets into thick woven comforters to putting multiple winter blankets inside a duvet cover or simply piling lots of quilts on top of one another. It does not really matter which material you use as long as you achieve the 10% of your body weight recommended ratio. For example, the average flannel quilt weighs around 1.5 pounds, so to test a 15-pound comforter you would need 10 of these stacked together over you. That’s going to be a real pain having to handle all of those, but if you manage to have a few thick heavier woven wool comforters that might be slightly heavier, you’ll need less of them to experiment with. Yes, I know that sounds strange but putting some smaller books spread out inside a duvet cover will also add a significant amount of weight, though it may not be the most comfortable it may give you a general idea of whether you’d like the weight or not. You can also pad this ‘book-duvet’ with a ticker comforter so you don’t feel the lumpiness as much. This is a great one to try as the bean bags will more directly simulate what your heavy blanket will feel like. For a 20-pound comforter you can put 20 x 1-pound bean bags (if you have that many) or 10 x 2-pound bean bags, into a duvet cover or between two blankets, sew it together and try it out that way. This test has you making several plastic Ziploc bags filled with those round glass marbles or pebbles you see the kids play with. For a 15-pound heavy blanket fill 15 bags with 1-pound marbles each and pin them evenly on top of a quilt of our choice. This one could require a bit expending if you don’t have the marbles, but it could feel like a relaxing massage if you nail it with your DIY skills. It may end up being uncomfortable to some people though. Lie under it and see if you love the results. The best way to use dumbbells is not to place them on top of you but rather to weigh or pin your comforter’s sides down. Put a few winter blankets on top of each other and place the weights down on each corner to weight the blankets down over your body. A lot of people might not fancy this one, as it would require a lot of washing. If you own a horse or frequent a riding school, you may want to try using your horse’s blanket as a trial. Each one can weigh like 1 pound, and you can fold it to make it have less surface > more weight and may just do the trick. Do however put another blanket or sheet between you and the horse blanket for added comfort. If you ride motorcycles and own a couple of heavy leather protective clothing items, you can do a test by folding some heavy jackets inside a woven blanket and place it on top of you. Much like compression stockings or socks you’d wear during a flight, you could try sleeping with compression vests underneath layered blankets too. This has a similar effect to the pressure touch therapy provided by using a weighted blanket. Though the real McCoy is still the best way to go, you can see that there are many nifty ways to do a trial run before investing in your own weighted blanket. Bare in mind though, that these ‘make-shift’ ideas won’t be anywhere near as comfortable as the real deal, so don’t let that put you off, and use them as some sort of “if this feels kind of right, then an actual weighted blanket could actually be great for me” mindset. After all, if you think you might like one, then just go with your gut, you most likely will love it. And once you have purchased your very own heavy blanket, I can almost assure you, that you won’t look back. While your medical insurance obviously covers your and your kids' physical checkups, the great news is, it could pay for your heavy blanket too. Sure, coverage varies from policy to policy, and state to state, but it will never hurt to call the customer service and learn what you shouldn’t pay out of pocket for. Unfortunately, the majority of health care insurance plans don’t cover a purchase of weighted or sensory tools. Even when the tools are considered durable medical equipment. Read the "Durable Medical Equipment" section of your policy. That'll help you find out if any weighted products are included in the list. Even if they aren’t, it's worth it to talk with your insurance provider. Will the blanket company help you? Today, there are also some weighted blanket sellers who partner with health insurance companies. They help their customers to get their purchase covered by insurance. The procedure is free of charge. The thing is, many heavy blanket sellers go through the challenging process of the necessary and applicable regulations so their products and tools can be sold as a medical device. The process is long and challenging, but it’s worth a candle. The only problem these sellers may encounter is partnering with small, regional insurance companies. If you have a regional insurance, you have a smaller chance of getting coverage. How to Get a Weighted Blanket Covered by Medical Insurance? First of all, you need to call your insurance company and read the policy, even if they tell you they don’t cover weighted products. You will also need to get a prescription for a heavy blanket from your doctor or occupational therapist, and make sure your claim is billed properly. The sellers that partner with medical supply companies can help you ensure that your claim is processed correctly. You might also have to purchase the weighted comforter first and then turn the receipt in to find out if it can be repaid or covered by the insurance company. If you’ve ever dealt with insurance, you know that it’s a great pain. Unless you’re well aware of all the ins and outs of the healthcare insurance industry, you will need to do your research. Some insurance companies require prior authorization as well as a pile of papers and documents that you should collect – that’s another pain. Other companies are more honest and they claim they don’t cover weighted products, without misleading you. Some of the most renowned insurance companies in the United States that promise to cover weighted blankets are Medicaid, Mass Health, NHP, Network Health, and BCBS. In order to submit a claim, you will need a prescription with a diagnosis code and a certificate of medical necessity. Some companies may require additional papers. Since weighted blankets can be considered medical expenses, some of them may be tax deductible, if you have a prescription from your doctor, your insurance plan may cover your expenses. Find it out before swiping your credit card! Is all this trouble going to be worthy? Well, if you established whether you like sleeping under a heavy blanket or not, you will find that a properly manufactured blanket is very comfortable and cozy. The materials used for filling them, and the blanket itself often fulfill their purpose, which is to maximize your comfort and improve sleep. You may want to check out this article about reasons to buy a weighted blanket, if you really want to know if you should do it. 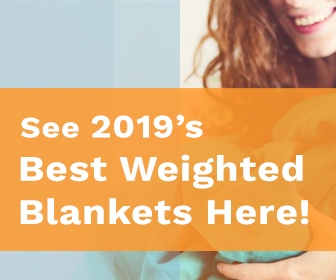 Also, I have researched a lot, and put up a list of the best weighted blankets you can buy online, some of them are surprisingly budget-friendly, make sure to check it out! Good morning , you listed a couple medical company’s that pay for weighted blank is Cigna Health spring one of them. I don’t know sorry Amy, all the best with finding one! My grandson has non verbal autism, sensory issues, and developmentally delayed. His Dr wrote prescription for weighted blanket. Insurance company said they would pay for it. Can’t find a pharmacy or medical supply place that carries them. Any recommendations for WV, KY, OH. Tri state area?